Dragon Ball began as a manga written by Akira Toriyama, chronicling the adventures of a cheerful monkey boy named Son Goku, in a story that was originally based off the Chinese tale Journey to the West. The manga was soon adapted into one of the most popular animes ever made. In Dragon Ball, Goku and a huge cast of friends and enemies search for the magical Dragon Balls that they could use to make a wish come true. Of course, no sooner had someone gathered and used the Dragon Balls than they would have to be sought out again. On top of all this Goku was training up to fight in the periodic "Strongest Under the Heavens" tournament. The series is generally broken down into the following sagas: Emperor Pilaf, the first World Martial Arts Tournament, the Red Ribbon Army, Tienshinhan, King Piccolo and Piccolo Jr, with minor filler plots. After defeating these major threats to the world, Goku finally won the tournament on his third attempt and went off to get married. After that, the anime (and the American version of the manga from that point) experienced a name change to Dragon Ball Z, while it continued uninterrupted as Dragon Ball in the Japanese manga. The reason was the Dragon Ball Z period had a change in focus from martial arts comedy to more serious epic battles. At the start it revealed that Goku was not simply a boy with a tail but one of the last of the alien race, the Saiyans. He was sent into space shortly before the Saiyan planet was destroyed (shades of Superman). Goku and his friends, reinforced by former enemies (a recurring theme) had to fight progressively more powerful villains. Although Goku and his martial arts skills (which let him and his friends fly, throw energy blasts and read minds) dominated the battles, the story was mostly about Goku's son Gohan and how he faces the challenges. Running seven years and nearly 300 episodes, the series can be broken down into the four primary Big Bads of the series: Vegeta, Frieza, Cell and Majin Buu. Both Dragon Ball the manga and Dragon Ball Z the anime came to a triumphant conclusion after Gohan is married and his own daughter Pan enters the "Strongest Under the Heavens" tournament. 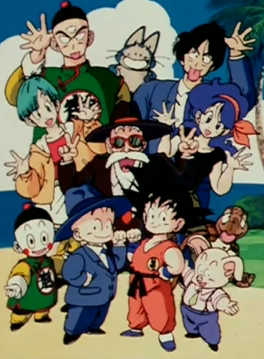 After several years of no new media beyond video games repeating the history, a reunion OVA Dragon Ball: Yo! Son Goku and His Friends Return!! was produced and a Massively Multiplayer Online Role Playing Game, simply titled Dragon Ball Online was released. While the MMO was short lived, thanks to poor reception of its gameplay, and never released outside of Asia Dragon Ball Online was noted for including series creator Akira Toriyama, as one of lead designers of the game]]. Toriyama had noted the plot of the game is is considered canon to the world of Dragon Ball. 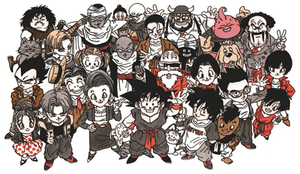 The series's 20th anniversary brought with it Dragon Ball Kai (Kai meaning "revision"), an Updated Rerelease released incrementally starting in 2009. Kai not only scanned the original animation in HD as expected for a rerelease, but cut out the Filler, Padding and much of the Off Model material. The English version of Kai also brought with it a newly recorded and updated dub which fixes many mistranslations and Dub Text. After the Kai rerelease brought the series back into the public conscious a new movie, Dragon Ball Z: Battle of Gods, was released. It was followed by another new movie Dragon Ball Z: Resurrection "F". Unlike the previous movies these two are canon and were followed by new TV series Dragon Ball Super. Just how much of Toriyama's plot from Online is still canon remains to be seen. Dragon Ball Xenoverse and its sequel salvage many elements of Online's plot and includes it in the post Battle of Gods canon. However like most spinoff media Toriyama only served an advisory role with minor art design. The success of Dragon Ball is hard to dispute -- it became one of the biggest hits ever in Japan, it was the series that popularized manga and anime the most in Europe, Americans always have an idea of what it is when they hear its title, every single Latino who grew up during the 90's has watched it, it's still running on TV internationally and merchandising is alive and well. It is sometimes derided for being simplistic and for drawn-out multi-episode fights with little story progression. However one must keep in mind that the show is primarily aimed at kids and teens age 10 to 18, with older adults not really in the picture. Dragon Ball is supposed to be fun and thrilling, and it generally achieves this. There were many Non Serial Movies (only a few could be wedged into the series' timeline) released at least once a year, three set in the Dragon Ball timeline and thirteen for Dragon Ball Z. Two made-for-TV movies were made for Dragon Ball Z, which are technically in Canon. There was also a seventeenth feature film based on the original series produced to commemorate the tenth anniversary of the franchise, as well as a web special in 2008 produced to commemorating the 40th anniversary of Shonen Jump. To date, there's been three Live Action Adaptations: The American-made Dragonball Evolution, which came out in 2009, and the earlier, campiers, Taiwanese Dragon Ball: The Magic Begins and Korean DragonBall: Fight For Victory Son Goku. In the early 2000s, the manga was re-released in Japan as the "Kanzenban" or "Perfect Edition," with brand-new covers drawn by Toriyama. This condensed the original 42 volumes down to 34, included all of the original color pages, and every other issue included a booklet with a drawing by current, popular Shueisha artists, talking about how much Dragon Ball had influenced them. The final volume in 2004 included a new, adjusted ending written and drawn by Akira Toriyama. Now also has a Spin-Off manga called Dragon Ball SD in Saikyo Jump by Naho Ooishi which began on December 3, 2010, exactly 26 years after the first chapter of the original series was first published in Shonen Jump. As of June 21, 2011 there's another Spin-Off called "Episode of Bardock", What If Bardock survived, also by Naho Ooishi; later in the same year the Bardock short received an Animated Adaptation, and Shueshia started to reprint brand new copies of the original manga, all of it in its original 42 Volumes glory, although with a different stylized logo for "Dragon Ball". There are a couple of Abridged Series out there, including Alternate Reality DBZ and the enormously popular version by Team Four Star. There's also a weekly Podcast hosted by the Daizenshuu EX crew. Finally, it's worth mentioning Dragon Ball Multiverse, whose drawings are impossible to differentiate from the official material. Needless to say, its impact on Shonen manga is, well... impressive — to say the very least, its influence now impossible to not see in almost any work in the subgenre. Although not the first employ the vast number of the tropes its most associated with, it became the de facto face of them. To this day, the Shonen work, and various Anime in general that use elements from, pay homage, or parody, this series continue its legacy. For proof, one need only look as far as these three anime — often considered the most current and direct of its spiritual successors: Naruto, One Piece, and Bleach. Frothy Mugs of Water: Indirectly. Kamehame Hadoken: Co-trope namer with Street Fighter. ↑ And its popularity levels are OVER NINE THOUSAND! This page was last edited on 11 February 2019, at 02:31.